Just when it seemed that China-Japan relations were slowly inching toward some semblance of normalcy, a new issue is souring ties: Chinese fishing boats illegally entering Japanese waters to poach red coral. The poaching centers around Japan’s Ogasawara islands, an island chain located around 1,000 kilometers south of Tokyo. An estimated 100 vessels are illegally operating within these waters, part of Japan’s exclusive economic zone, in a bid to collect red coral. Besides being a violation of Japan’s EEZ, the harvesting of coral damages fragile ecosystems, destroying breeding and resting grounds for fish species. A reporter from Japan’s Asahi Shimbun accompanied the deputy head of the Ogasawara islands fisheries cooperative on a tour of the region. In around two hours, the group encountered three illegal fishing vessels, one of which was openly flying a Chinese flag. China’s policy of using fishing boats to help bolster its claim to disputed regions makes it difficult to separate out rogue actors from government policy. In the South China Sea, Beijing encourages fishing operations in disputed territories as a means of exerting control without having to resort to military force. The Chinese takeover of the disputed Scarborough Shoal was preceded by a run-in between Chinese fishermen and the Philippine Navy. Chinese maritime surveillance vessels appeared to protect the fishermen from arrest, despite claims that they were poaching sharks, coral, and giant clams. More recently, Chinese fishing operations in the waters around the disputed Senkaku/Diaoyu Islands have increased even while official maritime patrols have dropped. Given this context, it’s tempting to read the illegal fishing activities near Japan’s Ogasawara Islands as Chinese policy, rather than the actions of a few bad apples. But it’s important to remember, as Zhang Hongzhou points out, that fishermen are ultimately independent actors. They are motivated by profit as well as nationalism. Indeed, China has struggled to enforce conservation-minded regulations in many areas, not just when it comes to illegal fishing expeditions. A recent investigation by the London-based Environmental Investigation Agency, for example, noted the role Chinese officials (from embassy staff to members of President Xi Jinping’s recent delegation) play in driving the illegal poaching of elephants in Tanzania. Endemic corruption and an ineffective legal system – both issues high on Xi Jinping’s agenda – play major roles in hampering environmental and conservation efforts. Meanwhile, the rise of the nouveau riche in China is pumping up demand for illegal products like ivory and red coral. As U.S. Assistant Secretary of State of Oceans and International Environmental and Scientific Affairs Kerri-Ann Jones pointed out in an interview with The Diplomat earlier this year, the challenge is multi-faceted. “Economic and social factors, knowledge gaps, governance challenges – including corruption, law enforcement, and capacity – and the low-risk, high-reward nature of wildlife trafficking are all important drivers,” Jones noted. According to the Asahi Shimbun, around 50 lawmakers from Shinzo Abe’s Liberal Democratic Party believe that the problem, in part, lies in the leniency of Japan’s penalties. “Under the current system, captains of poaching vessels caught operating in Japan’s exclusive economic zone are released if they post bail, and their seized marine products are returned to them,” the paper notes. 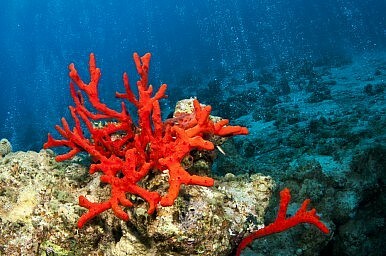 Since October, Japan has arrested five Chinese fishing boat captains for illegal operations, including coral poaching. Four have since been released on bail. Japan’s Fisheries Agencies has agreed to consider adopting stricter penalties on poachers.